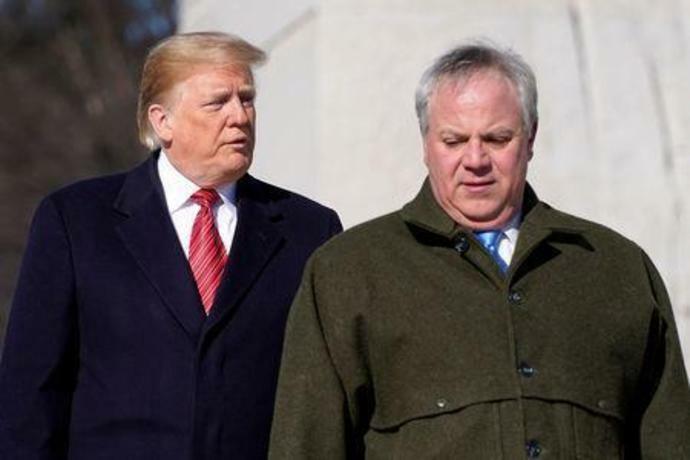 WASHINGTON (Reuters) - President Donald Trump said on Monday he would nominate David Bernhardt, a former energy lobbyist, to be secretary of the interior, the department that oversees U.S. public lands. Bernhardt, currently the acting secretary at the Interior Department, is widely expected to continue pushing the Trump administration's plan to boost domestic fossil fuels production by opening more U.S. public lands to drilling and mining. "David has done a fantastic job from the day he arrived, and we look forward to having his nomination officially confirmed," Trump said on Twitter. The Interior Department, which employs more than 70,000 people and oversees more than 20 percent of the U.S. land surface, has been central to Trump's "energy dominance" policy of boosting energy production. As Zinke's deputy, Bernhardt has played a role in efforts to open Alaska's Arctic National Wildlife Refuge to oil drilling, ease Obama-era protections on a bird called the greater sage grouse to boost drilling and mining across the West, and open federal lands to leases for coal mining. Bernhardt, who prefers conservative suits to Zinke's cowboy hats and boots, also worked a series of jobs at the Interior Department under former President George W. Bush from 2001 to early 2009, including as the department's solicitor. After working under Bush, Bernhardt became a lawyer and lobbyist at Brownstein Hyatt Farber Schreck for water and oil interests. He represented Noble Energy Inc , Rosemont Copper Co, Sempra Energy , and California's Westlands Water District, among others. Critics say Bernhardt's previous work as a lobbyist could risk conflicts of interest, unless he recuses himself from certain issues, because he worked for companies that could benefit by opening up lands to development. Despite their letter calling him a "walking conflict of interest", the Senate confirmed Bernhardt 53-43, on a mostly party-line vote, and with strong support from Alaska Senator Lisa Murkowski and other lawmakers who have large areas of U.S. lands in their states. If Bernhardt ascends to secretary, it would mirror the change of guard at the Environmental Protection Agency where last July Acting Administrator Andrew Wheeler, a former coal lobbyist, replaced Scott Pruitt, who stepped down after a series of probes into his conduct. Wheeler is a staunch proponent of Trump's energy dominance agenda to produce oil, gas and coal for both domestic use and export.